Even with the newest heat pump systems there can still be problems keeping all the rooms in your home comfortable. 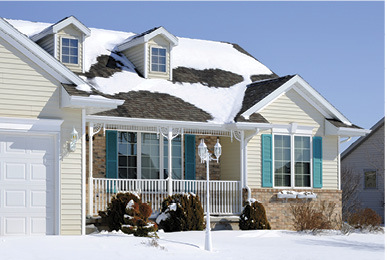 Someone is always too hot or too cold, particularly in a two-story home. Unless you install an expensive zone-control system with multiple thermostats, your heat pump can only respond to the temperature of the room where the wall thermostat is located. Numerous factors determine how much heating or cooling is used. These can include the number and orientation of the windows, what floor the room is located on, activity level and the length of the duct leading to it. There may also be differences in the energy efficiency of various rooms, which cause the temperature difference. Leaky windows are a common problem. When using an air-conditioning system, place an air deflector over the register to help distribute cool air. Check your home’s attic insulation, especially if it is the blown-in type. The insulation can shift, and some rooms can have 2 feet of insulation while others only have 2 inches. This will affect room temperature. Standard sheet metal ductwork often has many leaky spots, so some of the heated or cooled air leaving the heat pump never makes it to the rooms in your home. The joints between the duct segments are the most common areas that leak. Use a high-quality duct tape to wrap all of the joints, and this may take care of most of the problem. Each room should have a return air register, particularly bedrooms where the doors may be closed at night. Check the ducts near the heat pump. If you see short handles on each one, they are for controlling dampers inside the ducts. Partially close the dampers in the ducts leading to the rooms which are getting too much heating or cooling to force more to the problem rooms. Don’t try closing the damper in the room’s floor or wall registers. They typically are leaky, so the air flow will not be reduced by much. Also, the ducts inside the walls are probably leaky and you may have no access to seal them, so conditioned air is lost inside the exterior walls. If these methods do not provide adequate temperature balancing, consider installing duct booster fans. These small fans mount in the ducts to the problem rooms and force more air to them. The fans sense when the main blower turns on, and automatically run at the same time. Others have built-in thermostats to determine when they run. The fan can be wired into your blower switch to turn on with the heat pump. A simple do-it-yourself option is to install a small register booster fan. This fan mounts over the register cover and plugs into a standard wall outlet. The fan uses about 30 watts of electricity, and some are adjustable to turn on only when more cooling or heating is needed in that particular room. Setting the thermostat to “continuous fan” may also help, but note that it will increase your electric bill. The fan setting is most helpful if your new heat pump has a variable-speed blower that can continuously run on a low speed. These motors are also more efficient than a standard blower motor.